Champion Me Books gives you the opportunity to create customizable books that you can purchase in hardcover, soft cover, or E-book form. I created four customized E-books to review with my kids. I like the fact that with each book your child is the character. You add their name and create the character’s looks based on what your own child looks like. You can also add a dedication to each book. All of the books have a great story line, and are told in a fun, rhyming, sing song way. The illustrations are funny, charming, sophisticated and engaging. I was a little leery trying the e-book format. But I loaded it to my Android phone and we read it through a free e-reader app. I can really see the value of having the books in this format and on my cell phone. Since I always have my phone with me, I can pull my phone out and we can read these e-books whenever we want, especially in places like waiting rooms. I think these e-books would be enjoyed even more on devices such as Ipads, as the screen is larger. But for the time being, we’ll enjoy them on my phone! Enter to win one e-book copy of a personalized children’s book of your choice! Make it all about your child, just simply enter on the rafflecopter form below. Open World Wide (age of majority). Disclosure: The Mommy Bunch received a free copy of the product listed above to facilitate this review, however, all opinions are strictly our own! NextWin a Grand Prize Adventure Play-Set plus much more in our SUMMER SPLASH! 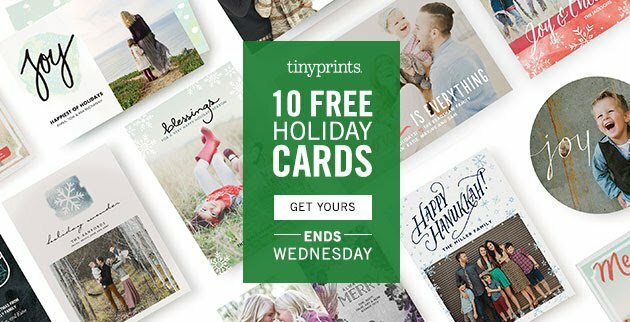 10 FREE Holiday Cards from Tiny Prints, just for YOU! Shop Your Way Sweepstakes – Many chances to win!